LEGO Architecture - Empire State Building: Overlooking the details on a minimalistic model. A particular line that had me intrigued when it first came out was the black box clad seemingly upper level collectible model line of LEGO Architecture models. The line pursues an effort to showcase a range of cultural building icons that range in size and price, with from what I can tell a random sort of application to how scale is approached. 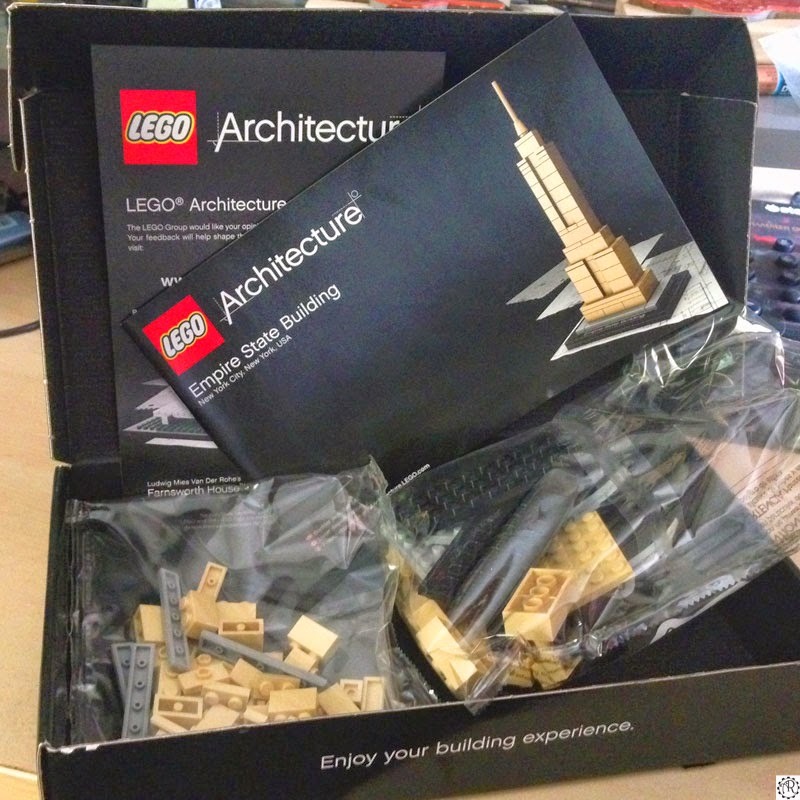 The particular model I will be talking about today is the LEGO Architecture - Empire State Building set (21002). The packaging is totally the opposite of all the rest of the LEGO lines that have come prior, with an emphasis on sort of an Apple inspired "premium" format kind of presentation that is visually striking on store shelves and looks right at home in places like Barnes and Noble and the like. I wanted to start out with a smaller model from this line, because I was not sure the minimalist approach to the overall look of the models was something I was too crazy about. As luck would have it, I managed to find the LEGO Architecture - Empire State Building set on sale for $12 (it normally retails for around $20 in most places). The contents included two poly bags of bricks, a set of instructions that also carried a minimalist aesthetic that mirrored the outer box. 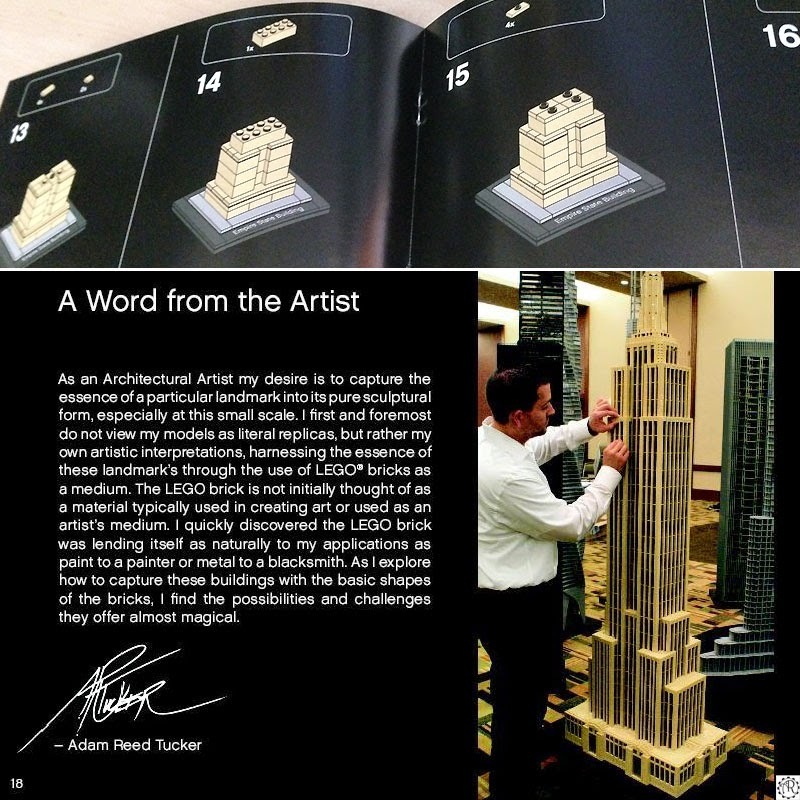 A nice little add in, a small spot light on the artist, and a two page are of facts and history of the real Empire State Building. I found the rating on this set to be an odd one. It's recommended for anyone 10+ years old, but the overall design and build aspect of this model would be hard pressed to give much of a challenge to your average 6 year old. I wager to think that the reason for the age approximation is because of the over abundance of vastly smaller bricks for the set, many which of course could present choking hazards for younger unsupervised kids. The major criticism was in the design towards the end: (left) 1. the overall stability of the model and (right top and bottom) 2. what seems to be a rare oversight in quality control with the model design. Everything about the LEGO Architecture - Empire State Building set really plays it up as a sturdy and fairly faithful minimalist rendition of the real thing. The problem is it has a few hits against it for me. 1. 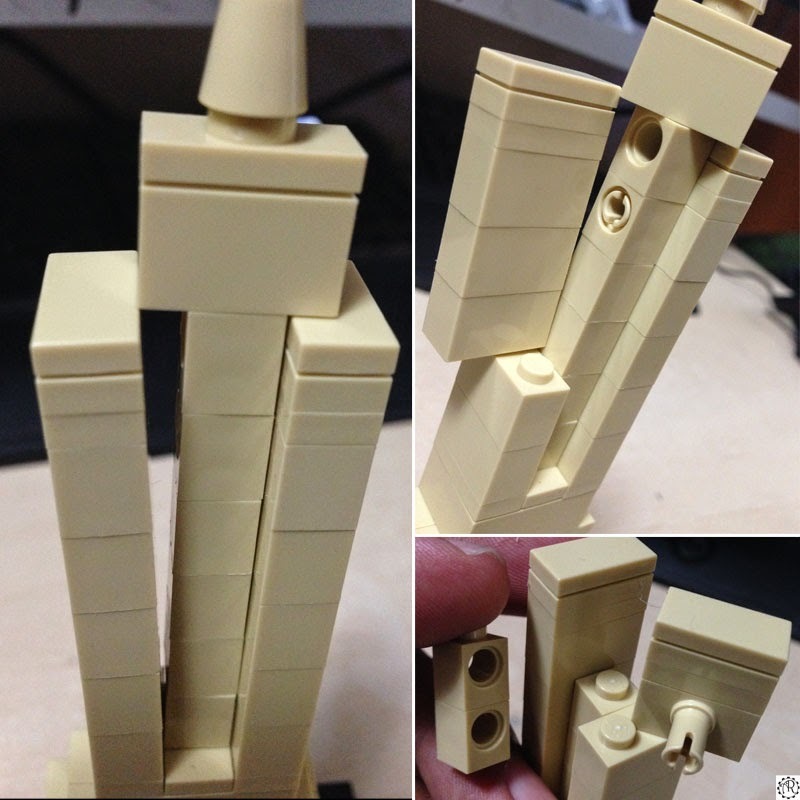 Shown in the above image on the left, is the fact that when handling the model a long stretch of the side of model is actually only attached by stacking a count of over four 2x2 bricks without any sort of "lock in support". 2. Which brings me to the connected issue (pardon the pun) of the other side being more than adequately secure because of the usage in place of a normal 2x2 brick, with a 2x2 brink that has an extension lock lug. The reason I find this irritating is because on far more insane sort of complex models (like anything out of Ninjago or the new Chima line), every effort to make almost redundant levels of stability shine in many ways so that the playability factor of the toys are in top form, is just par for the course for LEGO. 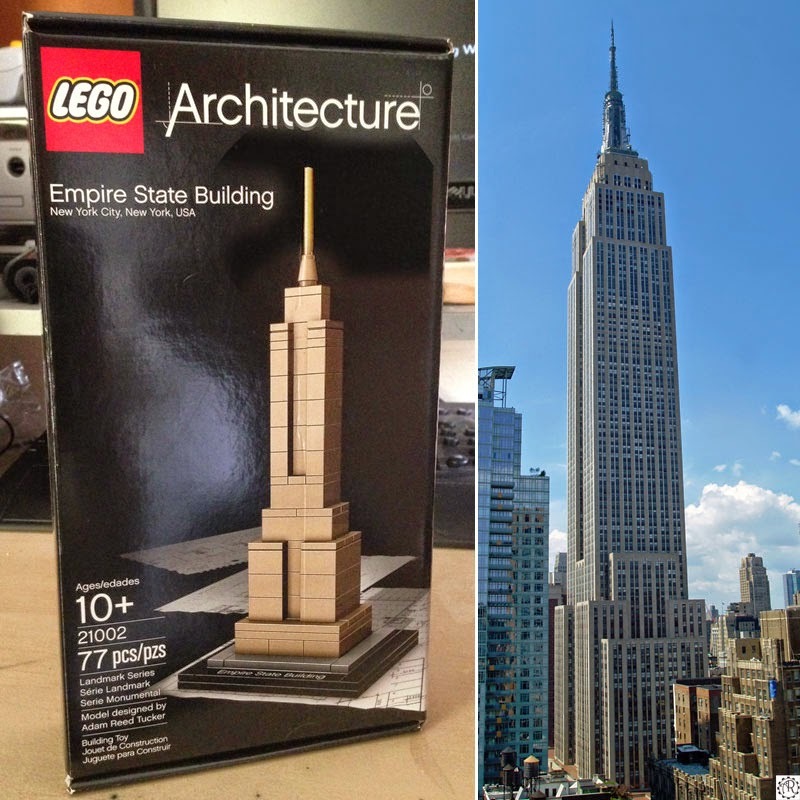 In my mind, the LEGO Architecture - Empire State Building set (as shown in the two right hand images above) just plain left out a second 2x2 with lock lug. Why do I say that? Because there are two receiving blocks that are part of the top section of the model! The top right image shows that there is one that is just there. No function for it. I know this seems like I am making a mountain out of a molehill, but considering the low brick count in this model, the high esteem and slick polish to all else about the presentation of the model... and somehow, quality control seems to have just overlooked that aspect of the final build. Kind of disappointing especially for the running retail price of between $20 to $30. So, in a final word, if you plan on spending a small bit of time on a sort of overpriced smaller model, and you REALLY like the Empire State Building... then go for it. It really does look like the real one, in a very minimalistic style, but doesn't hold up too well for young hands/rougher play very well. Solution? Order a companion 2x2 brick with locking lug for the set from LEGO, (my plan in the near future) and enjoy it as a desk/mantle set. Transforming Godzilla Eggs are No Yolk! threezero x Titanfall = Epic! Hot Toys Marvel Winter Soldier round up.